Published on May 14, 2018 in Recipes. 0 Comments Tags: apple, baked apple. 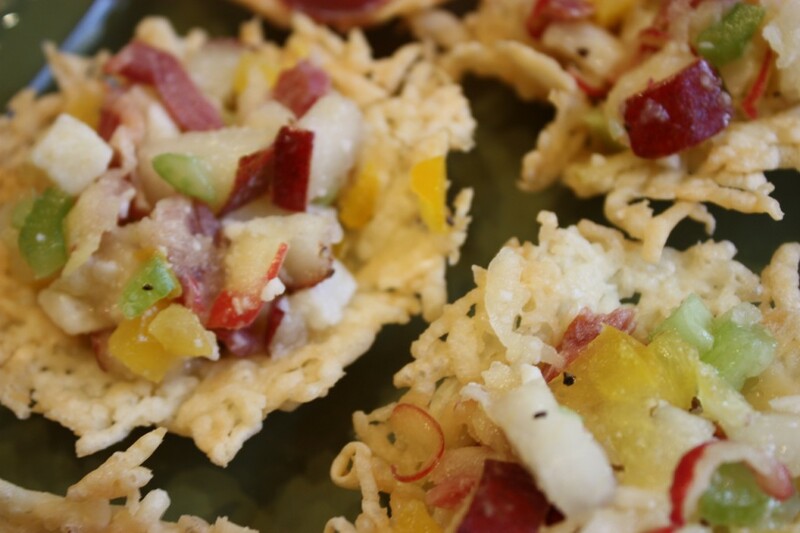 Published on February 16, 2015 in Recipes. 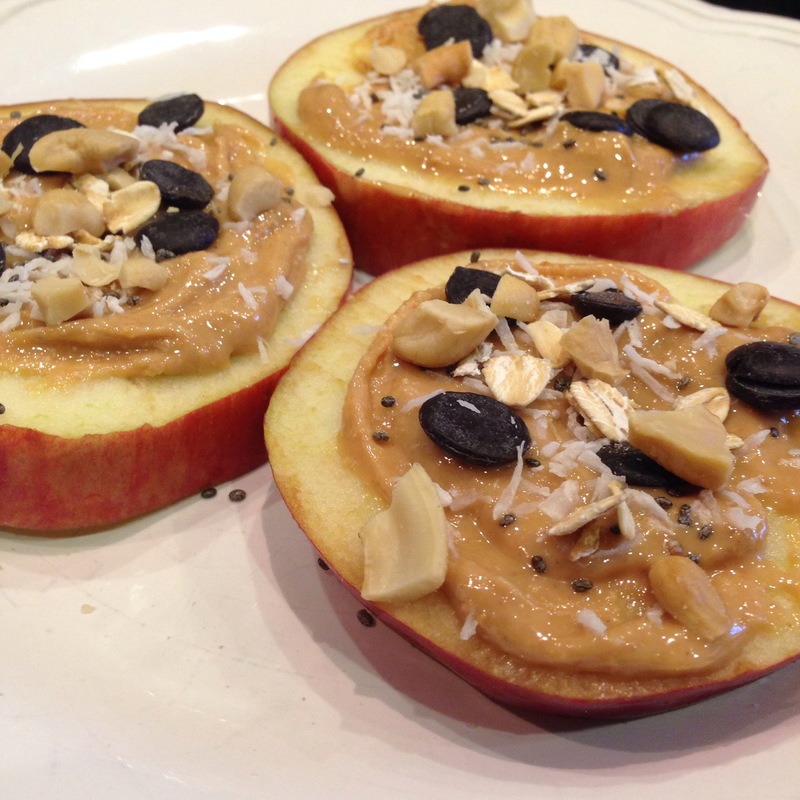 0 Comments Tags: almond butter, apple, Breakfast, gluten free, no bake, nut butter, raw food, Snack, vegan. 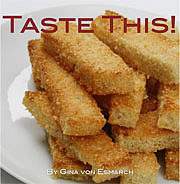 Published on March 8, 2010 in Recipes. 4 Comments Tags: @suezumout, appetizer, apple, bacon, caprese, crab ceviche, Manchego, orange marmalade, panzanella, Parmesan, Parmesan Baskets, pear, potato, prosciutto, steak, sue barkett zumout. This weekend started out a bit differently then the last five weeks – it was work free and friend and family-focused. The pace finally drew to a screeching halt after a seemingly endless series of projects and life came back into focus. On the menu: breathing, laughter, food and fun (plus a few great new recipes – I couldn’t tease you further, as you have so patiently awaited this next post amidst my hefty work load. TY). This post in itself was fun-filled. 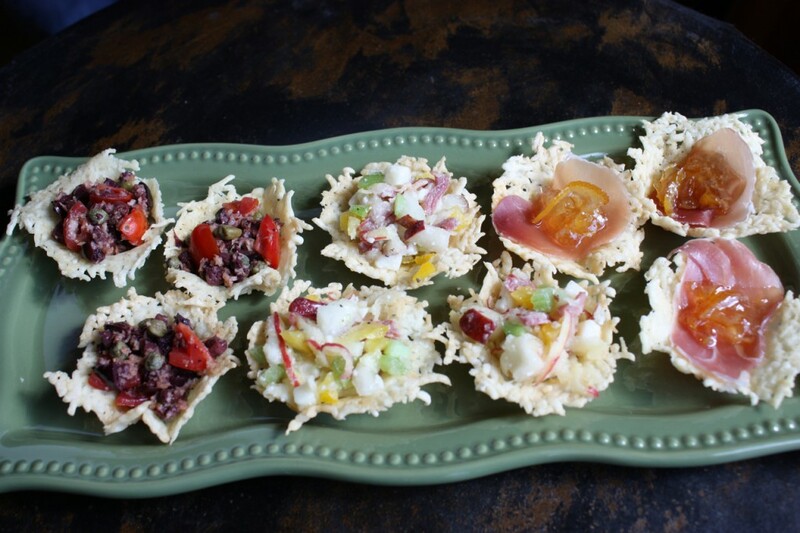 Conceptualized with my dear friend Sue Zumout @justforlicks, the concept was to create a shared post with a common element and put our own touches on it….enter stage right, Petite Parmesan Baskets, the adorable appetizer with numerous possibilities. We’ve developed six ideas, three you can find in this post and the remaining three can be easily found on her blog site (details to follow). 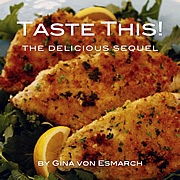 Trust me, it will be well worth the click over as her creations were wonderful too! Please note that to help keep the various recipes organized each filing as well as the basket recipe has its own ingredients and direction list. Note: to make the necessary basket form you will need mini-cup cake pans or another small item on which to form the basket. Preheat the oven to 350 degrees. Line cookie sheet with either a silpat or parchment paper. 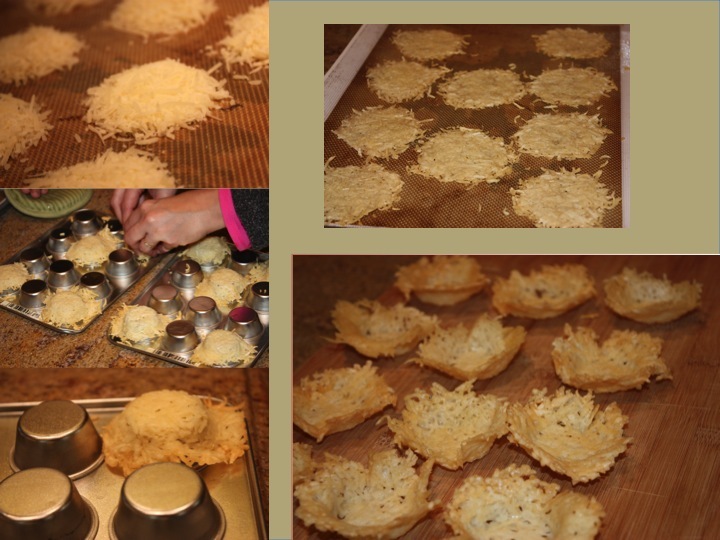 Pour 1 TBS increments of Parmesan cheese onto lined cookie sheet and flatten into a circular shape. If desired add optional seasoning. Bake on middle rack of oven until golden brown, approximately 7 – 10 minutes. Immediately after removing from the oven, carefully transfer cheese discs with a spatula and place onto an upside down mini-cup cake pan. It is important to work quickly to form the basket shape around the outside of the mini-cup cake pan before the cheese begins to harden. 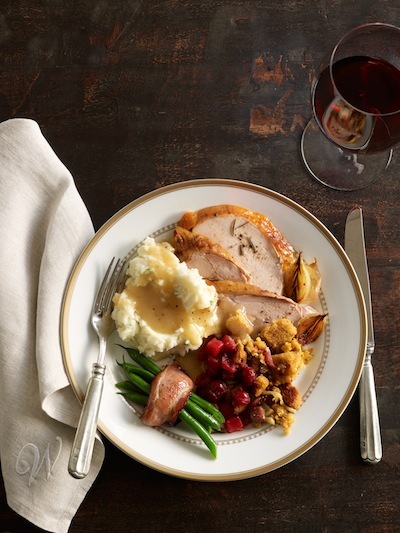 Baskets may be made two days in advance and placed on parchment paper in an airtight container at room temperature. 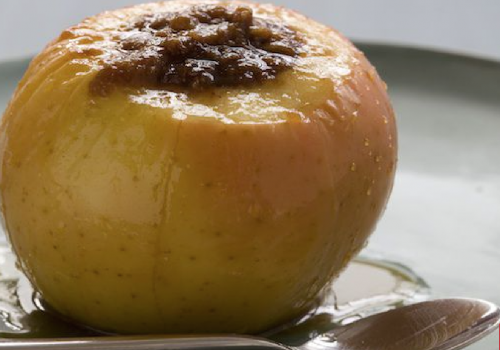 In medium-size bowl, add pear and apple and mix well with lemon juice. Add in celery, bell pepper, bacon, cheese, orange juice, vinegar and pepper. Mix well and chill until time to assemble in baskets. 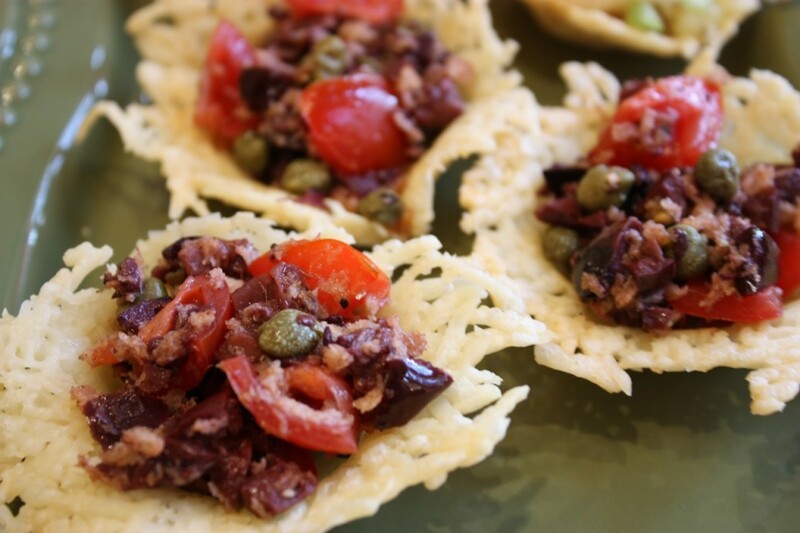 In small size bowl, mix together olives, tomatoes, capers and bread crumbs. Add olive oil, vinegar and pepper. Mix well and chill until time to assemble in baskets. 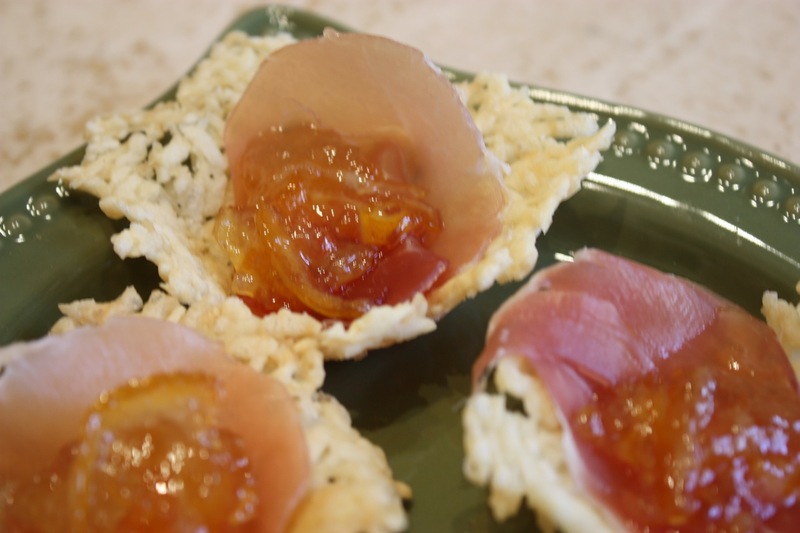 Take a nice piece of Prosciutto that fits well into the basket and top with a dollop of orange marmalade. 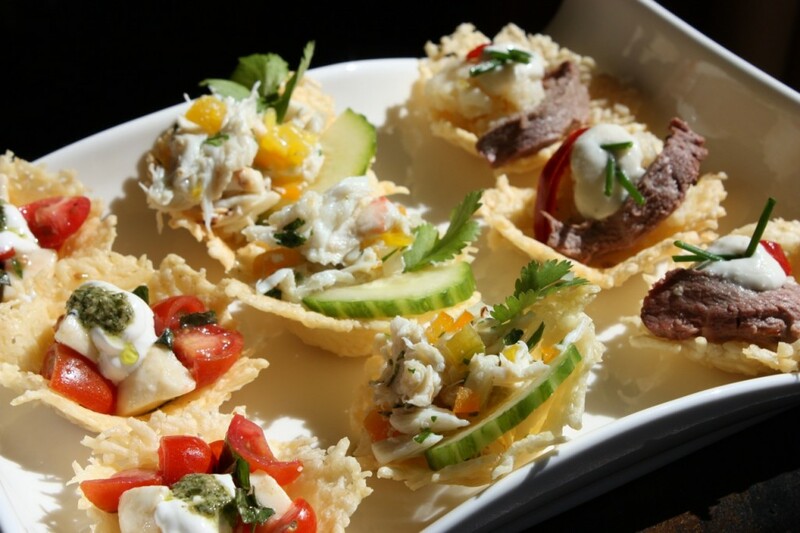 For three other great basket appetizer fillings – Caprese (tomato, basil, mozzarella cheese), Crab Ceviche, Steak & Potato visit my friend Sue Zumout at Just For Licks.